Combinatorial Chemistry has become a very popular technique in the armoury of the synthetic chemist, particularly in the pharmaceutical industry. A major part of this Chemistry is the use of solid phase chemical reactions (syntheses) which take part on the surface of specially designed polymer which are mainly in the form of beads or crowns (pins). This application note will give a brief overview of the Combinatorial Technique and outline how FT-IR spectroscopy can be used to monitor these synthetic sequences and also consider the relative merits of various sampling methods available for this type of analysis. Traditionally, drug discoverers have looked to natural product extracts or existing company libraries of compounds as a source of such materials. Unfortunately, many of these libraries can lack structural diversity and finding active products from natural sources can be difficult and very time consuming. This has lead to a change in emphasis away from a structured, rational approach to new compound discovery to a more empirical approach where the emphasis is on the synthesis of a very large numbers of new structures and using the rapid screening methods now available to test for activity within these groups. Once activity has been established a more step-wise approach to the synthesis is employed to isolate the active structure. Combinatorial Chemistry is the synthesis of a large number of different molecules in a quick and convenient manner. The starting substrate(s) is linked to a solid support material and subsequent chemical modifications to the molecules take place on the solid surface. At the end of the reaction sequence the final products are cleaved from the solid support using an appropriate chemical reaction. The difference between a conventional synthesis and a Combinatorial synthesis is shown in Figure.1. The advantages of this type of synthesis are that the many different products exist as easily separable “packages” (as opposed to a homogeneous solution) and that purification between stages in the synthesis is minimal. The ease with which large numbers of different products can be separated and re-reacted lends itself to automation of the total synthetic sequence. The Solid Support materials are normally polymers that are designed to be inert and have a large surface area. These are commonly in the form of beads (50-100 microns) or crowns (pins) although other forms are being developed. The earliest form of resin was the Merrifield Resin (Figure 2), based on polystyrene beads derivatised with chloromethyl groups and used in peptide synthesis. Other polymers are used in order to generate differing reaction environments; polystyrene giving a hydrophobic environment whereas a polyamide would generate a hydrophilic environment. Tentagel, which is 80% polyethylene glycol grafted to polystyrene has become increasingly popular since it is believed to generate a more “ether-like” environment which lends itself to a greater range of chemical reactions and hence a greater range of possible structures. The Linker Groups are the chemical groups that link the substrate to the polymer resin. Since it is this group that that must be broken at the end of the chemical sequence, their structure determines the method of cleavage from the resin. It is important that this cleavage reaction does not destroy the new products that the chemist has synthesised. The real importance, however, of these Linker groups is that they determine the terminal functionality of the product ; thus, by using the same Linker group for an entire chemical library all the resultant products will have the same end group functionality. Examples of these Linker groups are Wang Resin Linkers (Figure 3) which can be used in the synthesis of carboxylic acids. Other Linker groups include Rink Amide Linker (Figure 4) for primary amide synthesis and REM (Figure 5), HMB and Oxime Resins (Figure 6) which are for tertiary amine, C-terminally amidated peptide, and alkylamide synthesis respectively. There have been several different techniques used in COMBINATORIAL SYNTHESIS to generate large libraries of new structures quickly and efficiently. One such method is described as “Mix and Split” (Figure 7) and was developed by Furka. This is where, for example, three initial materials X,Y, and Z are bound to a resin and mixed together. The resultant mixture is split into three separate reaction vessels and each is coupled with a further set on reagents. Dimer samples from each of the three reaction vessels are saved for subsequent reactions. The remainder of the dimers are mixed, split and put into three separate reaction vessels again. These dimers are reacted again with a further set of reagents resulting in twenty-seven different structures being formed, nine in each of the three vessels. Product analysis can be carried out by cleaving the product from the resin and carrying out a normal classical chemical analysis by some form of spectroscopy. The chemist, however, would like some means of determining the success of his reactions whilst the substrate is still attached to the resin. This would allow him to proceed with the next stage in the sequence without the inconvenience of the cleavage step. For single products this is normally done using IR or NMR whilst for multi-component mixtures HPLC-MS is becoming the method of choice. The remainder of this note will consider the advantages and disadvantages of FT-IR (and Raman) spectroscopy as an analytical technique and also compare the various IR sampling techniques. It is worth noting at this point that in most cases the synthetic chemist wants to follow a reaction sequence rather than obtain a definitive chemical structure. This means that the monitoring by IR of the appearance or disappearance of specific functional groups is the required objective. This is fortuitous since the resultant IR spectrum from the resin-substrate combination, although dominated by the contribution of the resin, does indicate the presence of the required substrate functionality. It is also worth noting that it is preferable for the analysis to be carried out in the same laboratory as the synthesis and by a non-specialist and therefore the analysis should be as straight forward as possible. Once again it is fortuitous that most synthetic chemists are used to following reaction sequences by following the progress of various functional groups by IR spectroscopy. Diffuse reflectance on aluminised reflective pads. Although photo-acoustic spectroscopy has been used by other investigators, it has not been considered here since the technique requires some degree of expertise to be fully successful. 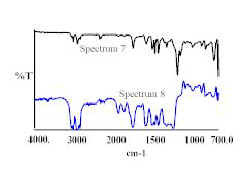 Figure 9 shows the spectra obtained from a Wang resin bead with substrate attached. 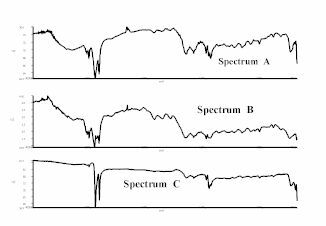 The three spectra were obtained using Diffuse reflectance (Spectrum 1), Single Reflection Diamond ATR (Spectrum 2), and Reflectance Microscopy (Spectrum 3). Although the spectra are dominated by contributions from the polystyrene Wang resin, the important functional group in this synthesis was the carbonyl group whose absorption band is clearly shown at about 1770cm in all three spectra. 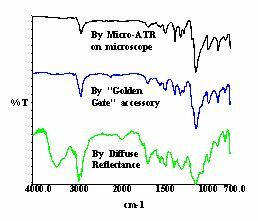 The same bead sample was analysed by micro-ATR on the IR microscope and Figure 10 compares the normal reflectance spectrum (Spectrum 6) with that using the ATR objective (Spectrum 7). A similar set of spectra was run for a second substrate on a Wang Resin. The diffuse reflectance (Spectrum 4), single reflection diamond ATR (Spectrum 5), and reflectance microscopy (Spectrum 6) spectra are shown in Figure 11. 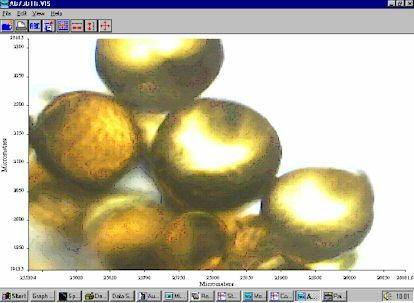 Similarly, the beads were run using micro-ATR (Spectrum9) and normal reflectance (Spectrum 10) on the IR microscope (Figure 12). In this particular example the detection of the hydroxyl group (absorption band at ~3300cm) is paramount in the structure identification. It is clear from the above data that this it is extremely difficult to detect this band using single reflection ATR methods either on the Diamond ATR accessory or on the microscope. This may be because these techniques sample such a small area of the sample and hence small amount of sample or it could be due to the wavelength dependence of such ATR techniques; absorption bands at higher wavenumbers do appear less intense than lower wavenumber absorptions. In an attempt to eliminate this later effect an ATR correction was carried out on one of the above ATR spectra and the results are shown in Figure 13. The top spectrum shows the original data and the bottom shows the result of the ATR correction. Although the hydroxyl absorption band is slightly more distinct it is still a weak feature and could be overlooked. Also the fact that such post-run manipulation is required would tend to compromise the ease-of-use criteria. Although the KBr disc method of preparing samples can be considered as difficult and time-consuming, it can produce completely satisfactory spectral results. Figure 14 shows the KBr spectra for both the Wang beads analysed above and show all the relevant features required by the chemist. Since it is clear that transmission mode spectra do show the required features without being totally masked by the contribution of the polymer resin, an alternative to KBr disc making was sought. 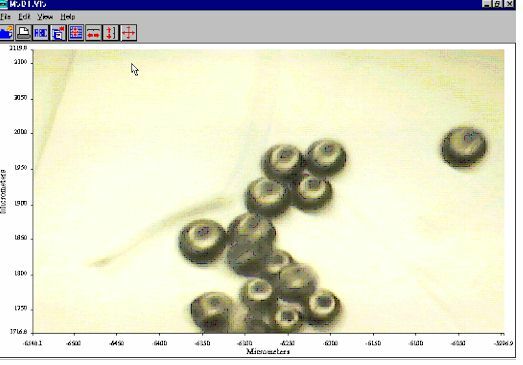 One such option is to use a Diamond Anvil Cell to crush a few beads between the diamond windows and run this directly on the IR microscope (Figure 15). The quality of this data is very good, the top spectrum showing clearly a strong carbonyl absorption band and the lower showing the hydroxyl grouping. 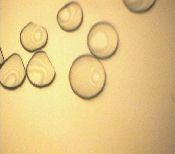 To determine if similar data could be obtained from other types of beads, the same techniques were used to obtain spectra from a substrate on a Tentagel bead. 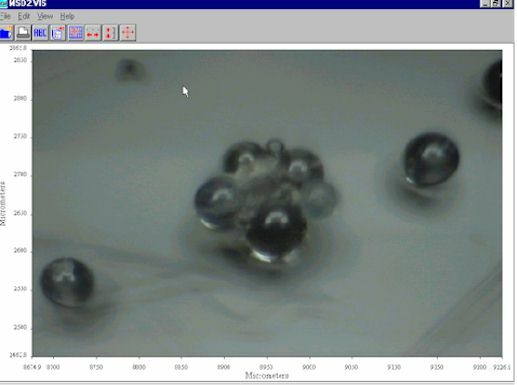 Figure 16 shows the micro-ATR (top), single reflection diamond ATR (middle), and diffuse reflectance spectra from such a material. Once again in this example the detection of the hydroxyl group at ~3300cm is important. As with the Wang resin, the diffuse reflectance spectrum shows this absorption clearly whereas in the ATR data this feature is barely detectable. These Crowns come in a variety of shapes and sizes with the most common shape being shown in Figure 17. They are normally about 3 to 4 cm in length. 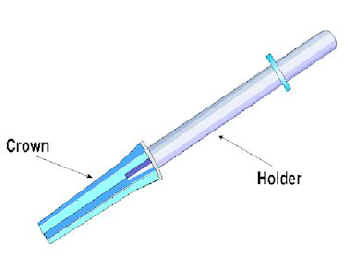 The initial starting material is bound to the surface of the polymer Crown. In use they are suspended from a tray into a reaction vessel into which differing reacting substrates are found in solution. Between each step in the synthesis the tray is raised from the reaction medium and the Crowns washed with an appropriate solvent. The IR analysis of these Crowns does present additional difficulties over that for the beads. 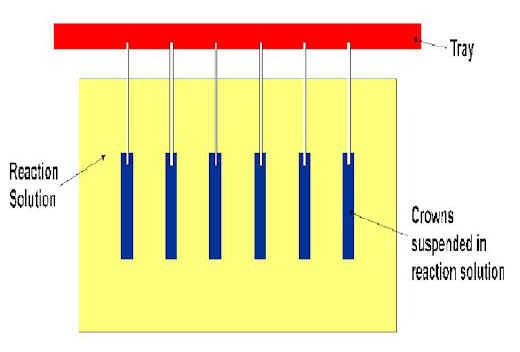 The shape and their structure rules out performing straight transmission measurements on them and since the surface of one Crown may contain the total yield of the synthesised material the chemist is particularly concerned not to destroy or damage the surface; he will require the Crown for the next stage in the reaction. These criteria tend to rule out the use of Diamond ATR accessories which would require that the Crown be compressed or that a part of the Crown be cut off. The three techniques used for the analysis were Diffuse Reflectance (using the abrasive rods supplied with the PE accessory), Reflectance Microscopy and Micro-ATR on the microscope. The results for a substrate on such a Crown are shown in Figure 18. 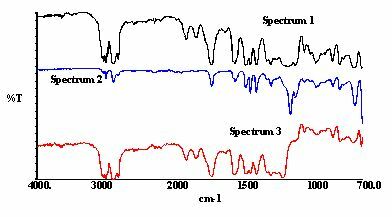 Spectrum A shows the diffuse result, Spectrum B shows the reflectance result and Spectrum C the micro-ATR measurement. In this example the product contains a carboxylic acid group and whereas both the diffuse and reflectance spectra show the carbonyl and hydroxyl grouping, the ATR measurement shows only very weak features for both. One of the main advantages of Raman Spectroscopy is its ease of sample preparation. This would be an obvious benefit to the combinatorial chemist wanting data quickly from the beads or crown in a non-destructive manner such that he can easily move on to the next stage in the synthesis. 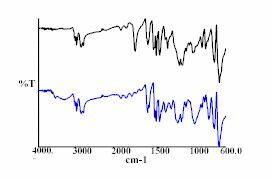 The results shown in Figure 19 are the Raman spectra from two different crowns. The top spectrum is from the crown with the initial starting material on the surface whereas the lower spectrum shows the result after two reaction steps; the result of these reactions is that the new material contains a carbonyl group. Although the spectra are of very high quality and are very easy to obtain, they are totally dominated by the contribution from the polymer crown itself and show no bands to the reactions. Additional Raman data was obtained from other samples with the same result, namely that the intense Raman spectra from the polymer support is much stronger than that of the substrate of interest. 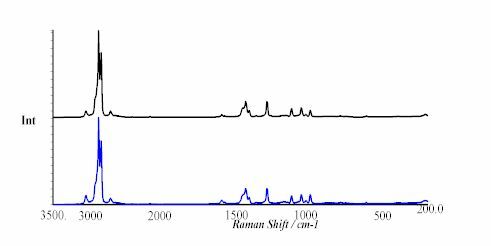 The relative usefulness of Raman compared to IR can be clearly illustrated by taking the above sample containing the carbonyl grouping and comparing it’s Raman with it’s IR spectrum (Figure 20). 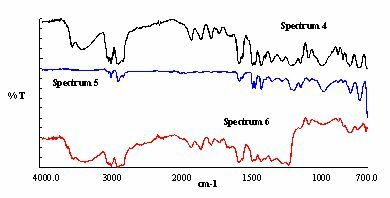 The top spectrum is the Raman data whereas the lower spectrum shows the IR data in absorbance units for ease of comparison. 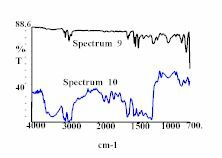 Although it could be argued that the Raman spectrum is a better spectrum, it is the IR one that shows the required carbonyl absorption. [It should be noted that no attempt was made to find a system ‘ideal’ for Raman study. The aim was to compare the usefulness of several analytical techniques applied to the same type of sample]. The relative ease with which FT-IR spectroscopy can determine the success or failure of a combinatorial synthesis appeals to the synthetic chemist. The fact that IR is a do-it-yourself technique means that the results are available immediately to the chemist. It would appear that the best techniques of analysis are diffuse reflectance using the aluminised pads, KBr discs, transmission through a crushed bead, or reflectance microscopy. For crowns, diffuse reflectance or reflectance microscopy would appear to be the best options. Although ATR sampling techniques result in very good quality spectra, there is a real danger that the relevant absorption bands are too weak to detect easily. 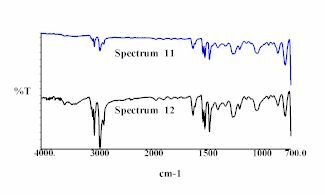 Raman spectra seem to suffer in the same way; the absorption bands of interest are very weak compared to the very intense bands due to the supporting polymer.